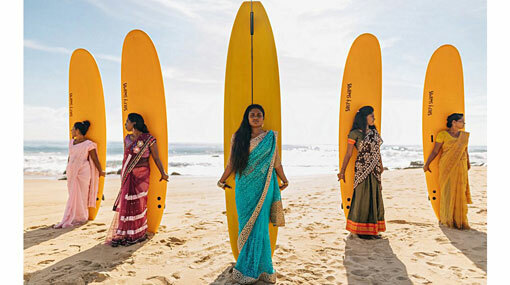 Shamali Sanjaya, a confident, 30-year-old mother and surfer from the small Sri Lankan town of Arugam Bay, serves as the president of the country’s first all-female surf club. She leads group meetings, organizes beach cleanups and coordinates surf trips for the small-yet-growing group of 17 local women surfers. But just a few years ago, Shamali’s experience as a surfer in Arugam Bay looked very different than it does today. Sanjaya didn’t start surfing consistently until she met Tiffany Carothers, a California surfer who moved to Sri Lanka in 2011 as a volunteer with Surfing The Nations. Carothers would take Sanjaya and her sister out for a surf, but Sanjaya would get teased for being out in the lineup and even dealt with some family members who weren’t pleased with her new hobby. To avoid her brother’s overt disapproval, Sanjaya would sneak in surf sessions with Carothers when she knew her brother would be in another village. Sometimes, if he caught her out in the lineup grabbing a few waves, he would stand on the beach with a stick and hit the ground, signalling that he wanted her out of the water immediately. In 2015, Carothers – along with visiting Australian surfers–organized an event to teach more women in the village how to surf. The event was successful, in Carothers’ eyes, and got over 30 local women out in the water. But within two months, word had spread about Carothers’ event and she was summoned by a town official, who told her that some men in the village were unhappy about their wives and daughters taking up surfing. It was insinuated that Carothers’ family would be kicked out of Arugam Bay if the surf lessons continued and that if she really wanted to help, she should buy the women sewing machines.